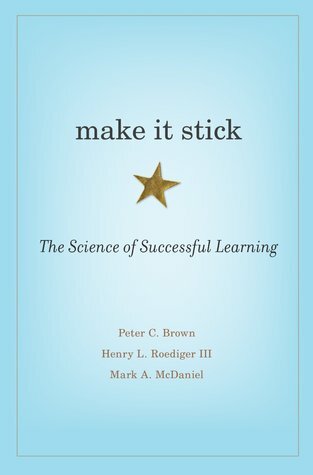 I started listening to the audiobook version of Make It Stick this summer and finished by reading the last couple of chapters in the physical book over winter break. I started with the audiobook since I was on a road trip and had plenty of time to listen but I chose to finish with the print version so that I could review the extensive end notes and recommendations as well as look back over the earlier chapters that I had only listened to. The content of this book definitely makes it worthwhile to own the print version. The first chapter lays out why this book is necessary right in the title, "Learning is Misunderstood". There is much that we do in education, in coaching, and in self-improvement that is contrary to what scientific research has shown us is best for learning. 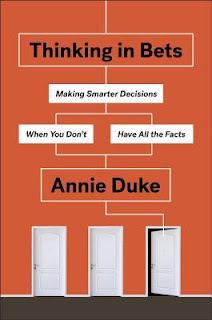 The authors make it clear that one of the biggest obstacles we face to getting better at learning is what we already think we know, both about a subject as well as about learning itself. They sum this up with the phrase "the illusion of knowledge". It is important that we recognize that illusion as best we can as often as we can and the rest of the book is full information for doing exactly that. Retrieval - The essence of learning lies in recalling and applying knowledge properly. Research suggests that getting good at that means that we should practice retrieving knowledge frequently. This means regular testing, or "effortful retrieval", of what we have learned to check that we can retrieve necessary knowledge. This testing should be delayed after any initial test to make the retrieval more effortful. For coaches, this means creating structured training and competitive situations that give our athletes opportunities to execute skills that we have been working on, both recently as well as in the past. Spacing/Interleaving/Varying - If we think that retrieval is all there is to learning, then rote memorization and cramming would be adequate learning methods but we have plenty of evidence to contradict that notion. We make learning better when we space out our learning over time, interleave work on different subjects together, and vary the settings in which we apply the desired knowledge. Spacing out tasks prevents us from making the tasks repetitive, which leads to decreased learning. Interleaving tasks is an efficient way of spacing, since we can fill time between similar tasks with other, unrelated tasks. Varying tasks is another way of preventing the brain from slipping into repetition. For coaches, this means moving away from blocked training ("massed practice") as soon as possible so that athletes are not allowed to become mindless while just racking up repetitions. It means not just moving from one skill drill to another but creating drills and games that require use of multiple interleaved skills. We should embrace the opportunities to regularly create unique practice plans. Generation - Continuing to separate ourselves from memorization means generating answers rather than recalling them. That means "trusting that trying to solve a puzzle serves us better than being spoon-fed the solution, even if we fall short in our first attempts at an answer." For coaches, this means not just letting our athletes fail but putting them in situations where the outcome isn't certain. It's an invitation to get out over our skis a little. We are more likely to learn the same lessons but to learn them much better. Metacognition - There is great value in thinking about how we think as well as what we think. Metacognition gives us opportunities to reflect on our mental models and get feedback on our blind spots and our biases. Metacognition helps us move out of Kahneman's system 1 thinking and into system 2 (more about that here), which increases learning. For coaches, this means engaging our athletes by asking them questions. Asking them questions helps them reflect on their thoughts, decisions, actions, and outcomes. When they are given these opportunities, they can learn far better than when answers and instructions are constantly given to them. Structure-Building -To make ourselves better learners, we must move beyond fixed ideas of learning "styles" and build our own structures that incorporate both what we are comfortable with as well as what makes us uncomfortable. We must search for the rules that underlie the structures we wish to build. We are building ways to solve problems we have yet to see. For coaches, this means creating settings where athletes can explore and get feedback first from the environment, then from themselves, and only then from us. We should see here that structure-building is an activity that is built on the previous concepts. We prepare our athletes for structure-building by helping them learn and utilize the above concepts first. Explain to students how learning works - We owe it to our athletes to help them understand that learning is often ugly, uncomfortable, and nonlinear. Teach students how to study - To help them get the best out of themselves, we must teach athletes not just the game but how to approach learning the game. Create desirable difficulties in the classroom - As I mentioned in #3 above, failure should be built into what we do and the key is to make the level of difficulty manageable. Be transparent - We shouldn't make things hard just because and we should talk to our athletes about why and how we create desirable difficulty in our practices. There are many important ideas spread throughout this book. I strongly recommend reading this for yourself and keeping the book handy. 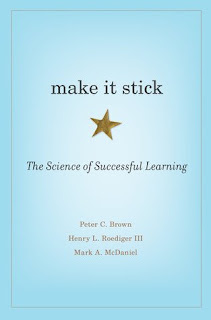 I expect to find myself referring back to it as I do my own work to "make it stick".